HIP HOOP JUNKIES - A Toronto Raptors/NBA/Canada Basketball Blog: It was a good fight, Toronto. The season finale on Sunday afternoon was a heartbreaker. 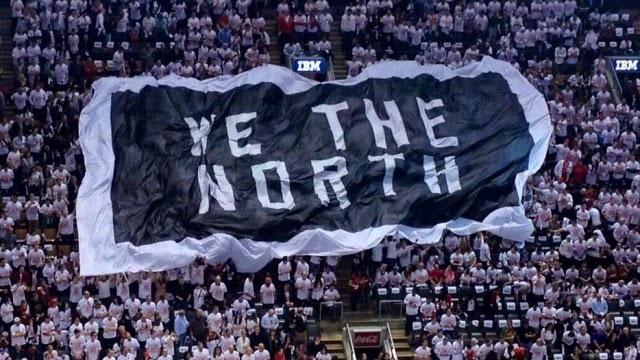 There was a huge Canadian fan base ready to watch something special happen, and even though Toronto was the #3 seed, we still felt like Toronto was the little brother that was trying to make a statement. The fact that the Raptors were a #3 seed in an NBA playoffs game seven in Toronto against the Brooklyn Nets was something inconceivable at the start of this season. But 82 games later, we witnessed DeMar DeRozan and Kyle Lowry take their basketball games to another level. They helped push this team to a franchise record 48 wins. And when it came down to the final two minutes, it was DeMar and Kyle that were going to put the team on their back and push them to a second round series against the Miami Heat. 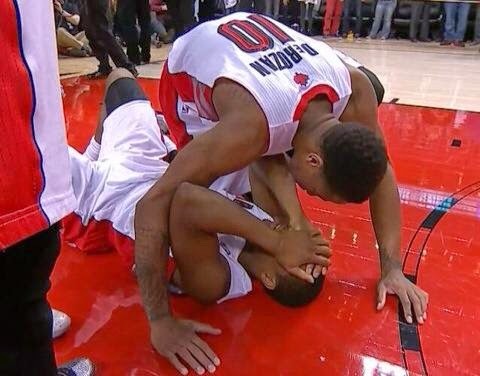 And after 48 minutes of play, we watched as the buzzer sounded... we saw a dejected Kyle Lowry laying on the ACC floor with his hands on his face and watched DeMar run to him immediately. This was a brotherhood of twelve guys who displayed what team chemistry actually was. This team didn't need a huge payroll to build team chemistry. It was a team of misfits and expiring contracts that went to war every night, pulled out surprising wins against some of the top teams in the league and created a Raptor fan buzz in Canada. It was a team that packed 20,000 strong at the ACC every night, had 10,000 people outside in "Jurassic Park" and millions at home across the country (some that have never even followed the Raptors) watching a game seven on a Sunday afternoon. Social media is a great measuring stick. How many friends did you have posting status updates about the Toronto Raptors? How many that you know have never watched a game of basketball in their lives? It was guys like DeMar DeRozan, Kyle Lowry, Terrence Ross, Jonas Valanciunas, Chuck Hayes, Greivis Vasquez, Tyler Hansbrough, Landry Fields, Amir Johnson, Nando DeColo, Patrick Patterson, Steve Novak, John Salmons and Coach Casey that created this interest. We talk about Vince Carter's Raptor days and what he brought to Canada basketball. He created a buzz in this country for a generation of kids that are now playing basketball to this day because of what VC showed them on that television screen. This 2013-2014 Toronto Raptors team took Canadian basketball love to another level. There was another generation of kids that followed this Raptors season that will find a love for the sport because of this team. Toronto was buzzing about this team. Canada was watching this team. Bandwagon jumpers or not, there were fans across the whole country watching. Other NBA franchises, other NBA fan bases, potential free agents and the rest of the world were watching as an outsider, and they witnessed the loyal fan base we have in this country. So for that final possession where Toronto was just one point away from a first round series win? It was tough to swallow for a moment but it was all worth it. This team got to a level none of us expected and never quit and never stopped fighting until the very end. It was a good fight Toronto, and I enjoyed every minute of it.